If you have any questions, please contact the Rebel Athletic Fund at (702) 895-1533. 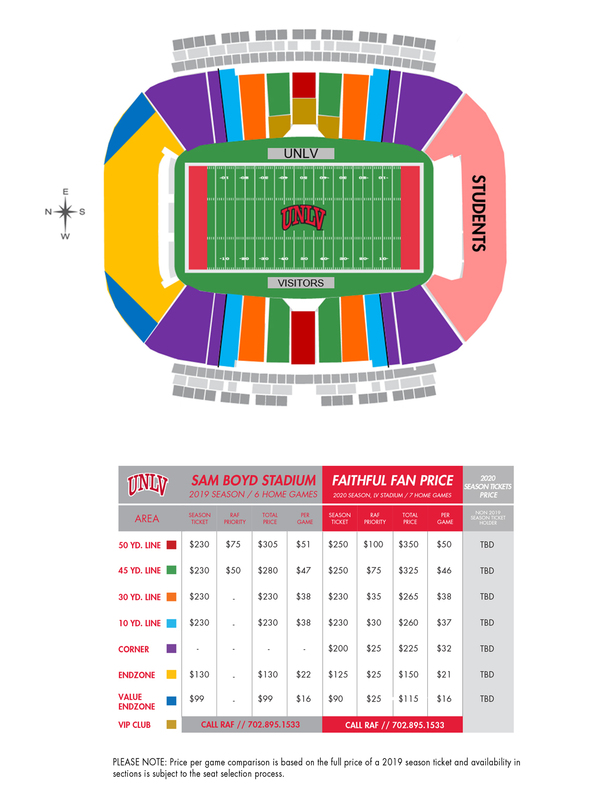 Lock in the "Faithful Fan Price" for the 2020 season in Las Vegas Stadium by becoming a UNLV season football ticket holder Today. Seating selection will be split into three (3) groups based on the guidelines outlined to the right. Our goal is to make this transition as easy and transparent as possible, while still valuing our most loyal fans. Selection for Las Vegas Stadium seats will be based on each ticket holder's RAF priority point ranking. Give additional dollars to the RAF to impact student-athlete experience and enhance your selection spot in line. NOTE: ALL GROUPS ARE ORGANIZED IN PRIORITY POINT ORDER. To qualify for football parking pass, a Rebel Athletic Fund member must be a season ticket holder and make a minimum gift of $100 to The Rebel Athletic Fund in the current year. Parking lot assignments are determined by the donor's giving level in the current RAF year, as well as availability. Each year, season ticket holders will be assigned a lot based on their annual giving level, starting at $100 per year. 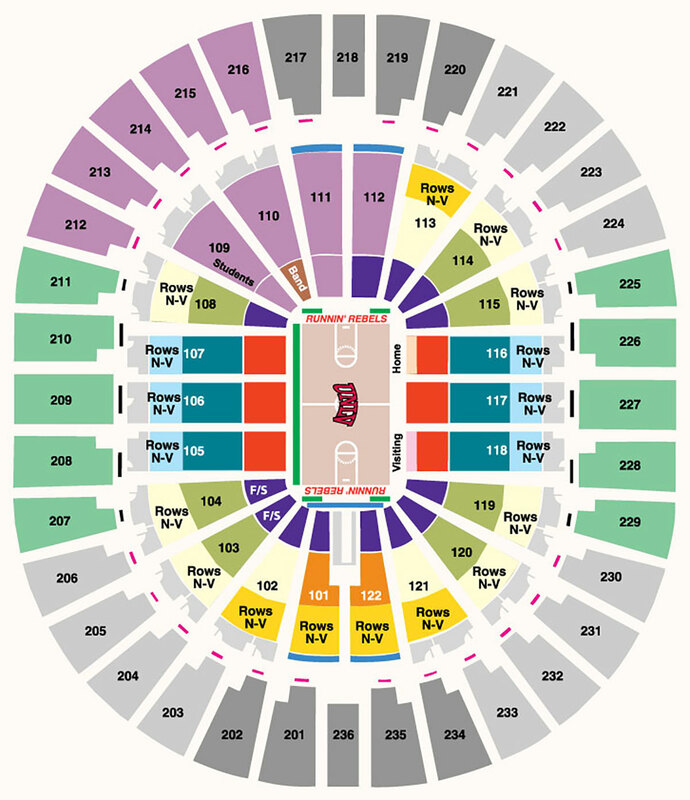 Season ticket priority does count toward a parking requirement and can be combined with additional philanthropic giving each year to reach a desired lot. See the full chart below for the complete range of levels and passes. For more detail on the location of these lots, please consult the parking map below or call the RAF Office at 702.895.1533. *Donor will receive one parking pass for every pair of football season tickets up to the allotted per giving level. 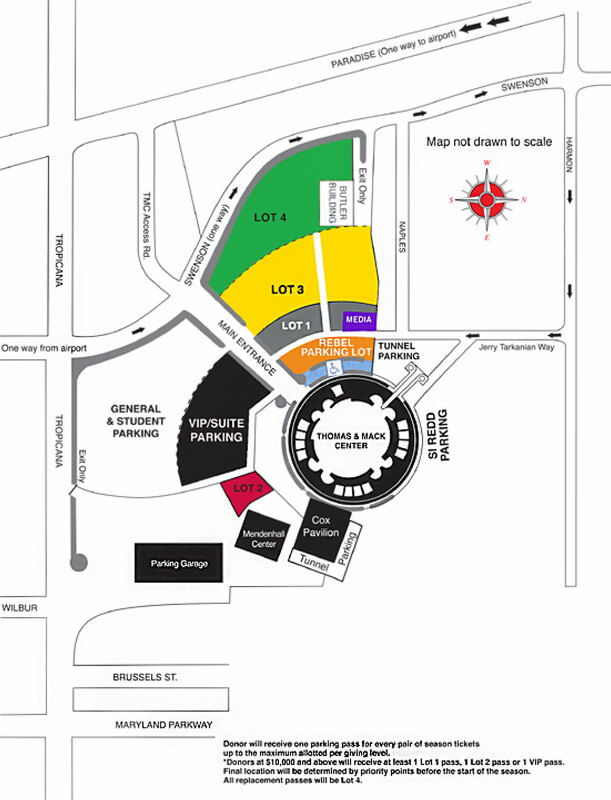 Your membership at the Rebel Circle level ($2,500) and above will grant you access to the RAF pre-game tailgate hospitality located within the Rebel Block Party. You will receive passes which is determined by your donor level and number of season tickets in your account. 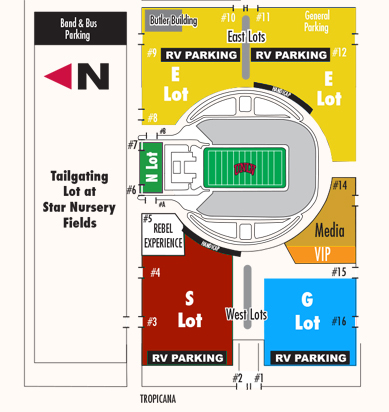 This tailgate area opens two hours prior to kick-off for each UNLV football game at Sam Boyd Stadium. Inside the hospitality area you will have the opportunity to meet and mingle with other Rebel supporters. Food and drink tickets will be provided upon your entry. * Requires a major gift donation to the Rebel Athletic Fund. Please contact the RAF Office at 702-895-1533 for additional information. Applies to new Gucci, Lower Bowl 1, Lower Bowl 2, and Lower Bowl 3 seats. A Rebel Athletic Fund member must both purchase season tickets and make a minimum gift of $500 to the Rebel Athletic Fund in the current year to receive parking. Parking lot assignments are determined by the donor's gift level in the current RAF year based on availability. Each year, season ticket holders will be assigned a lot based on their annual giving level, starting at $500 per year. Season ticket priority does count toward a parking requirement and can be combined with additional philanthropic giving each year to reach a desired lot. See the full chart below for the complete range of levels and passes. For more detail on the location of these lots, please consult the parking map or call the RAF Office at 702.895.1533. Donor will recieve one parking pass for every pair of season tickets up to the maximum allotted per giving level. *Donors at $10,000 and above will receive at least 1 Lot 1 pass, 1 Lot 2 pass or 1 VIP pass. Final locations will be determined by priority points before the start of the season. Membership at the Coaches Circle ($10,000) and above will grant you access to our most exclusive area, the Pregame Hospitality Room. Once inside you will be given access to some of the best restaurants in Las Vegas with a fully stocked bar. Doors to the venue open approximately 90 minutes prior to tip. 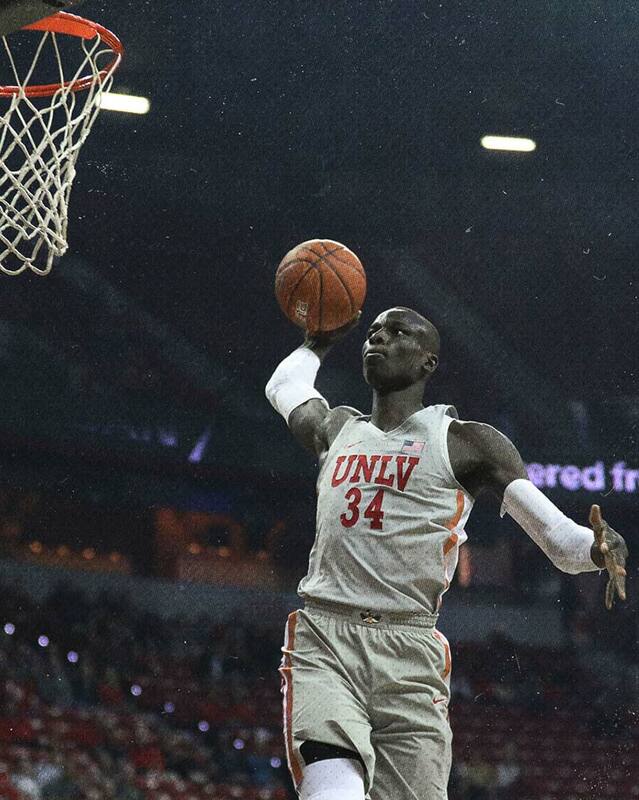 You will have the opportunity to meet and mingle with Runnin' Rebel Basketball supporters and enjoy quality time surrounded by other passionate UNLV fans. Food and drink tickets will be provided upon entry. 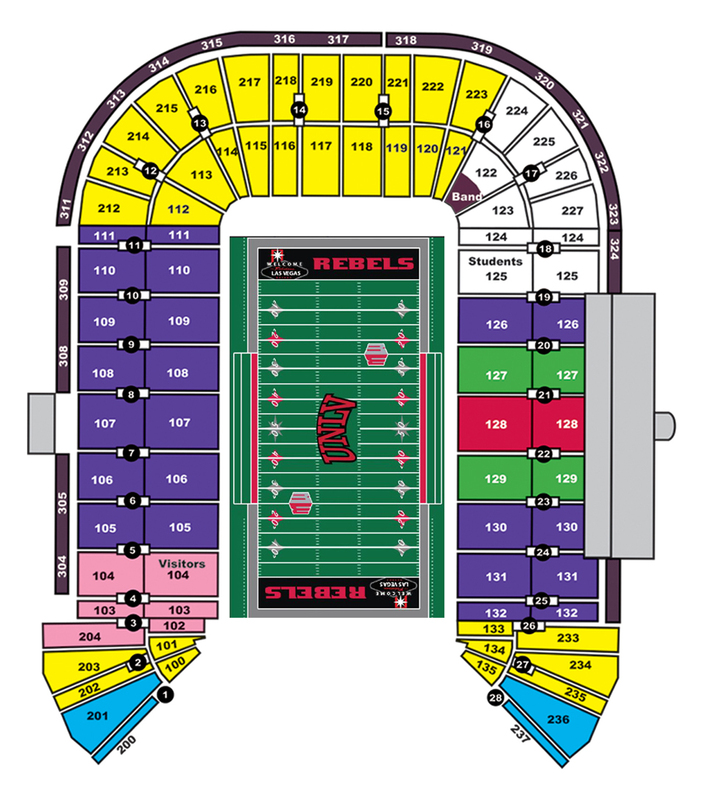 Membership at the Rebel Circle level ($2,500) and above will allow you access to Strip View Pavilion for halftime refreshments of beer soft drinks and light snacks. You can quickly and conveniently enter SVP and grab a quick beer to go or stay and enjoy your time inside the pavilion to talk with other Runnin' Rebel fans and supporters. Donor will receive one hospitality pass for every season ticket up to the maximum alotted per giving level.